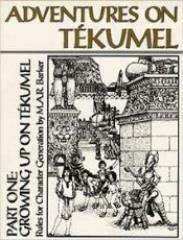 Adventures on Tekumel Vol 1, Part 1: Growing Up On Tekumel is a brief introduction to the fantasy world of Tékumel and a 'human character generator' for role-playing games based on it. The system produces a young character (aged 15 years or so) who can enter the role-playing game as a fully fleshed-out person. This book is required to play in TOME’s solo AOT adventures and to use the Gardásiyal role-playing rules effectively.